Friends of mine visited us today from Poughkeepsie, NY. Their younger daughter, named Shreya, commented so nicely a month ago and her parents told me that she wanted to see a meal being put together for her. It was a delight to have her, as well as her older sister and her parents, over today, and I named my dish in her honor. I sauteed on medium heat in a combination of olive oil and tangerine-pressed olive oil some half-moon sliced onion (one small red and one small yellow) for a few minutes, then added a package of tempeh, cut into small rectangles. 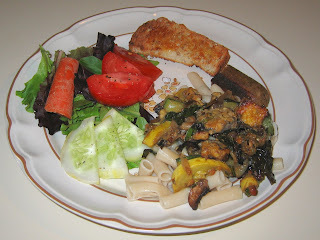 Several minutes later as the tempeh started to brown, I added two zucchinis cut into long strips, one summer squash sliced into maybe 3/8" thicknesses, and a lilac bell pepper cut into medium cubes, and also sprinkled on a little Mongolian Fire Oil. Maybe five minutes later, I added a fair amount (maybe 3/4 cup, packed?) of basil that I had purchased yesterday, after roughly slicing it, stems and leaves all, roughly into thirds. I let the basil cook down a bit, then mixed in some alder-smoked salt, tarragon, and freshly ground black pepper. I served this atop organic brown rice penne pasta by Tinkyada. 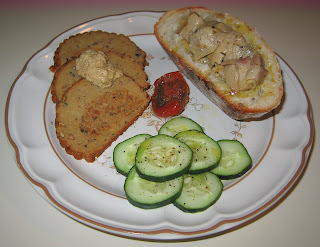 My friends had wanted to try vegan apple-sage sausage, so I also served that. Yesterday at a farmer's market, we discovered excellent cracked wheat bread, and I served a small slice, toasted, with Earth Balance margarine. Everybody seemed to enjoy the meal, and I appreciated my young friend's help and enthusiasm! Yesterday more relatives of mine arrived, my Dad's cousin and his wife. We had homemade dosa (a South Indian crepe - one of my favorite dishes) at my parents' home - yum! I received a call recently from a vegetarian manager at the local Mellow Mushroom, a pizza chain. I've found some Mellow Mushrooms to be reasonable, and others to offer only passable vegan pizzas. This manager wanted to get together to discuss how to make her restaurant more vegan friendly, and we were going to meet some friends there and eat. When I called to confirm, the manager said they were too busy to spend time together, so I found myself having to quickly put dinner together. I took advantage of some leftovers that I was able to remake into a good fresh looking meal. My wife had recently made some Bengal lentils; I'm not familiar with Bengal lentils, but they are yellow. I think that she had soaked them then cooked them with some cabbage, mustard seeds, and turmeric. We had some dark kale; I composted the stems and roughly tore the leaves into approximately one-inch squares. I also chopped half a Vidalia onion into maybe 1/4" cubes, and cut a quarter cabbage (from which the tough core I had removed) into thin strips. I started the onion sauteeing in tangerine olive oil over medium-high heat and a minute or two later as the onion was softening, added the cabbage. I let the sauteeing go on about 4-5 minutes, letting the onion get slightly brown and the cabbage get cooked, then added 1/2 teaspoon or so of cumin seeds, and a little salt and turmeric, as well as the kale. I cooked for maybe two minutes, letting the kale cook down a bit and ensuring that the spices didn't burn, then added my wife's leftover lentil dish and let it warm up for a minute or two, then served. I also served some French batard with tangerine olive oil drizzled on the cut insides, as well as heated leftover Basmati rice and tomato served with fresh basil (I planted basil a week or two ago). It was a good dinner! Yesterday after class, my cousin flew in for a visit. I picked him up and we all had my Mom's home cooked Indian food (radish-stuffed paratha breads, rice, dhal, okra, and cabbage, as I recall). Tomorrow, more of my family is joining the reunion contingent and we're having one of my favorite dishes, dosa (a South Indian stuffed crepe), at my parents' home! Incidentally, my Dad, who has been wanting to be vegan for some time, apparently is now just about there, if he can get my Mom (both are lifelong vegetarians) to stop serving him items with ghee, paneer, etc. Way to go, Dad! I wanted to use up the purslane that I had described and eaten raw on Monday. Today, I chopped the purslane into thirds or fourths, stems and leaves, and added it to a saute. 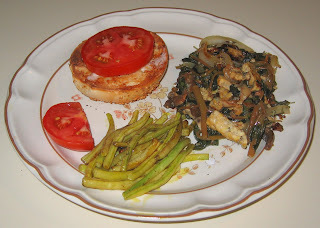 I had thin pieces of tempeh (about 1/3 of an 8-ounce package) as well as half of a Vidalia onion, cut into thin half moons, sauteeing. About 5 minutes into the saute, I added most of a (surprisingly mild) jalapeno pepper, cut into thin slices. 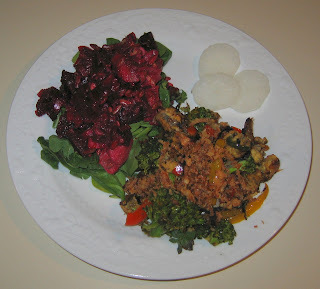 A few minutes later, as the tempeh was getting medium-brown, I added the chopped purslane and let it cook down for about 3-4 minutes, then added a teaspoonful or so of fresh oregano leaves. I let it cook just for a minute, then added about a tablespoon and a half of organic Baja Lime Marinade, a little salt, and a little dried parsley. I also cooked beans with garlic in tangerine olive oil, and served with salt, black pepper, and lime juice. Finally, a garlic bagel with a tasty locally grown tomato rounded out tonight's dinner. Yesterday, I gave a talk on vegetarianism for a church, and brought my aunt who is visiting from Connecticut. 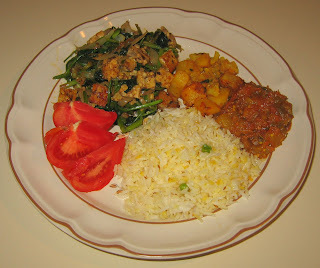 After the talk, we all ate at my Mom and Dad's home; my Mom had made a variety of Indian dishes like okra, dhal (lentil soup), rice, and potatoes. It was good! My wife and I ate separately today; I had my photography class in Morrisville, NC, and she had her Sanskrit class that she is taking in that same town. We're lucky to have my aunt visiting from Connecticut from yesterday afternoon for a few weeks (much of the family will be coming down in the next few weeks for a reunion here), and my wife took her to the Sanskrit class, much to my aunt's delight (she wants to take the class over the phone!). The two of them had dinner after their class at Tower South Indian Restaurant. 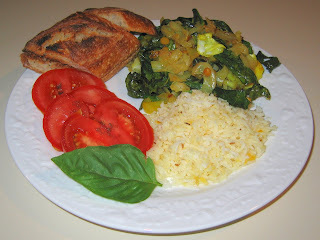 I came home and used the purslane that my wife had picked up from the farmer's market in Carrboro, NC on Saturday. I had worked with purslane once before last July in my "masked" days (! ); it tastes good both raw and lightly cooked (I plan to try a cooked dish with it tomorrow or Wednesday). 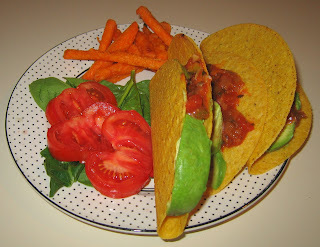 I made three tacos stuffed with salsa, purslane, and using up all of a ripe avocado. I also sauteed briefly some yellow colored beans that are probably a variant of green beans. As they cooked (for a total of just 3-5 minutes on medium heat with a little bit of oil), they turned green. I served the beans Tuscan style with a little lime juice, salt, and pepper. I also cooked some prepared potatoes O'Brien. It was a good meal! Yesterday, a friend invited us to his birthday party. I described the previous day how my wife and I aren't keen on Chinese food; we both ordered Thai dishes, but neither was very happy. I just don't like sauces or seasonings I run into with a decided Chinese twist; my wheat gluten dish had a heavy brown sauce that I didn't like. My wife's moo shu vegetables had coconut milk, which I like, but I still wasn't delighted with the sample that I tried. After dinner, I caught the end of the ADF musician's concert, then saw (on my own as my wife stayed on at the party) Before the Rains, a colonial story set in Kerala that I was a bit underwhelmed by. Tomorrow, I'm giving a talk on veganism at a church and my wife is teaching sitar; we may eat early or may eat with my aunt at my parents' home. It's the first day of summer and we enjoyed celebrating it a number of ways - attending a Pilobolus performance at ADF (I actually attended with a friend and her 3rd grade daughter a short 1-hour early afternoon performance, as well), visiting a relatively new "green" building store downtown (Common Ground Green Building Center) to find sustainably grown bamboo flooring for our new construction upstairs in our home as well as low-VOC paints, and treating a friend to dinner and having him join us to see Pilobolus. He had requested corn, so I easily obliged with my standard corn-off-the-cob with 3 ears of corn, Earth Balance margarine, salt, and lime juice. I prepared some strozzapreti pasta (see my recent blog entry for details on the name) and prepared a hash to top it with. That hash (traditionally, chopped meat, vegetables, and seasonings lightly browned by sauteeing) was just apple-sage vegan sausage cut into small cubes, as well as chopped scallion (one or two), shallot (one), half of a yellow onion, and two small bell peppers that my wife purchased today from a farmer's market, sauteed for perhaps 8-10 minutes in a tangerine olive oil, with rosemary (maybe 2 teaspoons of needles) and oregano (1 teaspoon or so) added in the last few minutes. I also mixed in some salt and ground black pepper. It was a good meal, and we enjoyed our friend's kind company! Tomorrow I'm not going to be making dinner. A friend is having about twenty of his friends, including my wife and me, join us at his favorite restaurant, Oriental Garden. My wife and I, unfortunately (but fortunately we both share the same dislike), don't like Chinese food, but do like Thai - hopefully there will be a good variety of Thai selections for us. Today, I used up these tiny potatoes that I had purchased at the farmer's market last weekend. I brought them to a boil and cooked them for about 20 minutes till they were done (a fork could go through with just a little resistance). I had also added green beans cut into 1" pieces in the last 4 or 5 minutes, and some English peas in the last few minutes. I drained and mixed in some olive-artichoke salsa, dill, and salt. I put a little tangerine olive oil in a cast iron pan and cooked two green onions, cut into thirds and then quartered into long strips for a few minutes, then added asparagus and thin cuts of seitan. I let it cook for about 4 or 5 minutes over medium heat, then removed the browned seitan to a container and served, topped with salt and pepper, the asparagus, discarding the toughened, stringy onion (it did its job flavoring the food). I put into the container with the seitan a little jerk seasoning and salt, closed the container, and mixed, then served the oh-so-tasty soft cutlets. It was a good dinner! We had a mellow evening, incidentally, enjoying Le Voyage du ballon rouge (Flight of the Red Balloon) by Taiwanese director Hsiao-hsien Hou. I occasionally teach a film studies course where half the course is dedicated to Ozu, and I find Hou's work sometimes reminiscent of the quotidian minimalism of Ozu's films. I had also recently seen Hou's 2005 film Zui hao de shi guang (Three Times). I finished my monthly film review tonight, as well, which was an interview with the filmmaker and lead in Brick Lane; I posted the review and the audio of the interview. Yesterday, my wife and I had the privilege of getting to take care of a sweet child (today is her five-month birthday!). My wife got to their home by 7:30p, and I got there just before 9p after my class, picking up some food (South Indian idli rice cakes and spicy sambar soup, flatbread naan, rice, and chickpea channa masala) that my wife had ordered from Sitar India Palace. Our little friend was crying and probably over-tired; after we got her into her crib, my wife and I enjoyed the food that I had picked up as our dinner. I purchased, a few days ago, a box of eight large white "stuffer" mushrooms and decided to make stuffed mushrooms tonight. I also found avocadoes on sale a few days ago, and purchased a few - I used two to make guacamole using rosemary, my signature way of making it (it also has lime juice, salt, pepper, green onion, and garlic). I also had some roasted butternut squash with cranberries that I had purchased (prepared), and heated and served it. To make the mushrooms, I used my thumb to remove the stem of each mushroom, then gently pulled off the loose mushroom skin reaching toward the now-open center. I saved the skin and stems, chopping the stems into small 1/8-1/4" cubes, and put the mushrooms into a pan of boiling water. I let the mushrooms cook for about five minutes till they softened a bit, then let them soak in cold water to stop the cooking. In the meantime, I made what turned out to be an excellent stuffing. I chopped a clove of garlic into small pieces, about a third of a container of seitan into 1/4-3/8" cubes, two asparagus spears into about 3/8" lengths, half of a jalapeno pepper into thin strips, and two or three short green onion spears into 1/4" pieces. I put the garlic into a pan over medium heat as the olive oil started to get hot; once the garlic started sizzling a bit, I added the seitan. A few minutes later, I added the other ingredients and let them all cook for about 5 minutes till reasonably well done, then I mixed in about 1/2 teaspoon of fresh oregano leaves, a little salt and freshly ground black pepper, and a few pinches of jerk seasoning. 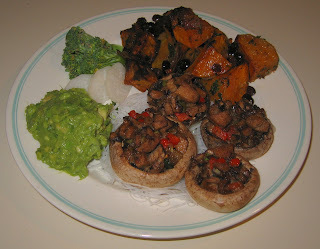 I patted dry the mushroom caps, over-filled them with the stuffing, and baked at 350°F for about 10 minutes, and served on a thin rice noodles that I had boiled. We both really enjoyed the meal! I occasionally write about my 3 a.m. pasta dinner - what do you do when hungry friends show up and it's late at night? Last night I had a slightly earlier version of this issue; I picked up friends from the airport around midnight, and they hadn't eaten. Luckily, I had an extra pizza left from Saturday, and started it reheating. In the meantime, I roasted two ears of corn and quickly had tasty kernels of corn with Earth Balance, lime, and salt, for them. I served their pizza with salad, and served some blackberry cabernet sorbetto and vanilla bean frozen soy yogurt for dessert. It was almost 3 a.m. by the time we wrapped it up! I'm glad that I tend to always have a well-stocked kitchen and often have good leftovers ready to go. We had an excellent American Dance Festival performance to attend tonight starting with Rust by Eiko & Koma (very slow and measured, as I think all of their dances are - my wife particularly appreciates their fascinating deliberate dance, but I'm also a fan), followed by Pure by John Jasperse Company (at times also minimalistic, a very interesting piece that surprisingly included disparate pieces of music such as by Bruce Springsteen, Janis Joplin, a contemporary gangster rapper, and Crosby, Stills, Nash, and Young) and ending with Les Noces, set to Stravinsky, by ZviDance. Check out the ADF season video! Anyway, I wanted to put a reasonably quick dinner together so we could get to the performance a little early. I ended up with a good meal that really didn't take so long to make. One thing that helped is that I used a prepared salad that I had purchased from Weaver Street Coop that sounded unique, potato-beet salad (it contains beets, potatoes, onion, celery, sunflower seed, canola oil, cider vinegar, horseradish, Dijon mustard, dil, salt, and black pepper). 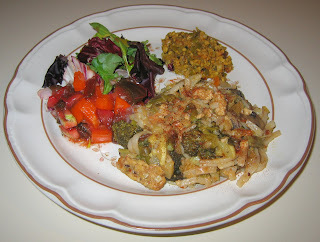 I made a simple saute with tempeh, spinach, broccoli, and a few other vegetables. I served it topped with Lars' Own crispy onions. I taught my 6-week photography class for the first time for the nearby Town of Morrisville (maybe a dozen miles away). The good news is that one of my favorite restaurants, Tower South Indian Restaurant, is also in Morrisville, close to the facility. The bad news, however, is that my class is 6-8p and my wife is nearby in a Sanskrit language class from 8-9:30p, so, though we are closeby, dinners after these classes will be difficult. I'll either eat on my own or with students, if they're interested, as opposed to our Thursday night Carrboro photography class outings. My wife ended up eating before her class at Tower, and called to say she was bringing home some leftover coconut rice. I made a simple side dish by sauteeing around four green onion spears, cut into 1 1/4" lengths and halved, for just a minute or so, then adding spinach greens and cooking another minute or so. I also served cucumber and daikon radish slices, as well as a pickled pepper. In my cooking classes, I have a "3 a.m. pasta dinner" that I show my students how to prepare when a friend shows up at 3 in the morning (e.g., as described last March). Tonight, it wasn't nearly as late, but I had to prepare a midnight dinner that would be filling and reasonably fast - we have an early 8:30a appointment tomorrow. We had a fun and full Father's Day - I made a waffle, hash brown, and fruit brunch for my parents, then my wife and I rushed off to an appointment and ended up, after what turned out to be a snack for me but a very early light dinner for my wife of some toast/sandwiches, at an outdoor symphony orchestra and a friend's house to meet their cute 7-week-old baby. The family are mostly raw food vegans, and offered us some delicious wholesome pie, which filled my wife. It was close to midnight by the time we got home - she was too sleepy to eat and not very hungry anyway, so I was on my own. I prepared some frozen vegan Spinach Florentine Rising Moon Organics ravioli , and served it topped with a little olive oil and Eat in the Raw's Parma! vegan "Parmesan cheese". 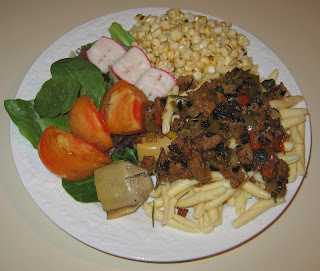 I also served some vegetables and fire-roasted corn-off-the-cob with Earth Balance margarine, salt, and lime. We had a full day, including a nice visit to the nearby Carrboro Farmer's Market and, surprisingly, three grocery stores, starting with Weaver Street Market, just a few blocks away. My wife was in the mood for a bagel, so we stopped at Bruegger's Bagels; it's in the same mall as Trader Joe's, so we picked just a few things up from there, as well. On to Whole Foods Market for the bulk of our shopping! I ended up with so many items that it was difficult to fit it all in my refrigerator! I had purchased some Red Russian Kale at the farmer's market and decided that it just wouldn't fit in the refrigerator, so it would be cooked! I also had brought home a twin pack of Vicolo Pizza organic cornmeal crust pizza shells, and came up with the idea of making a kind of pizza! I stripped the kale leaves off the stems, composting the stems and roughly hand shredding the leaves into one-inch or so pieces. 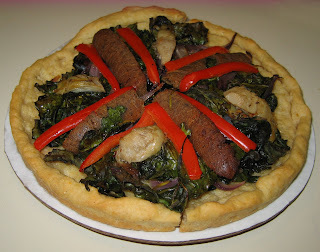 Instead of blanching the kale leaves as I've done in the past, I simply sauteed half of a red onion cut into medium (maybe 1/4" or slightly larger) half moons, then added a Field Roast Grain Meat Company apple-sage artisanal sausage that I had cut into eighths. A few minutes later, I added the kale leaves; within a minute or two the leaves turned a darker green, at which point I took the sausage pieces out and mixed in a little salt. 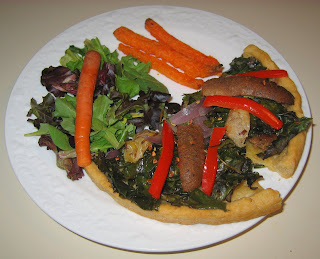 I put the kale-onion mixture into two pizza pie shells, then added the sausage, as well as red bell pepper slices and some marinated artichoke hearts. I baked the pizza and served it with (prepared from frozen) sweet potato fries. It was a good dinner in front of a very nice evening. My wife and I enjoyed the Ririe-Woodbury Dance Company (especially their opening and closing very contemporary pieces, Crucible and Tensile Involvement) and Trisha Brown Dance Company at ADF, then enjoyed some live music at the smoke-free Broad Street Cafe. There, we saw The McCauliffe Brothers Band, two brothers with a drummer performing reasonably good lyrical rock; and Oscar Begat, an interesting family band with a father, his two sons and a daughter, and two other band members playing folks rock. Yesterday, I had hoped to catch some live music downtown, and we rushed to pick up some picnic food at Whole Foods Market; we ended up just eating at the store and not getting to the music - the hot bar was unremarkable (I had two tacos and a variety of sides). I went on to see (for the second time - great film!) Das Leben der Anderen (The Lives of Others) outdoors at the NC Museum of Art - I so love these art museum outdoor films around each summer. On Thursday, it was my wife's birthday! After my photography class, I met my parents and her, and treated all to some very good food at Sitar India Palace. In fact, I had the best uttapam that I can recall ever having (including a few times I made my own)! My wife had boiled some Russet potatoes for lunch, and I found a cooked potato and a half that she hadn't used. I had the idea of making a hearty country style dish. I cut the potato into large chunks and began sauteeing over medium-high heat for maybe 6 minutes, adding half of an onion that I had coarsely chopped after the first two or so minutes. As the potato very gently browned, I added two artisanal Field Roast Grain Meat Company vegan apple-sage sausages that I had cut into eighths and then half by width. After another 4 or 5 minutes, I added maybe a tablespoon of fresh rosemary needles, and a few minutes later I added a little salt, paprika, and dill. I then mixed and served. I also made an okra dish. I steamed about a dozen okras for just 3 or 4 minutes; steaming before sauteeing helps the okra be less viscous and sticky. I then cut the tops off the okra and divided them into thirds or halves and started sauteeing them with the other half of the onion, cut into 1/4" to 1/2" cubes. It only took 4 or 5 minutes till the okra was reasonably cooked; I then mixed in fresh oregano from my garden and some jerk seasoning. It was a good dinner! 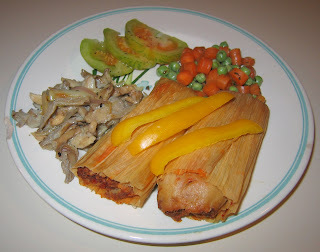 As I described this past March, I love tamales (and should learn how to make them! ), and am happy that 3 Hot Tamales, run by two vegetarian sisters and their Mom, sells frozen tamales. I recently purchased a box of their Burger Style Red Chili tamales, and today made them just by steaming them for 22-25 minutes. I served them with some warmed salsa on the side. I found some very nice slender baby French carrots today, and thought of making a jazzed up version of peas and carrots. I steamed several (four, as I recall?) carrots for 2 or 3 minutes, then sliced them and mixed in fresh English peas, a little olive oil, salt, and tarragon. My wife had a class tonight and I was going with a group of friends to tonight's ADF show (Limón Dance Company and Dayton Contemporary Dance Company). 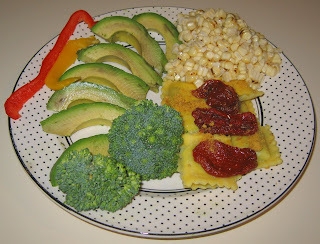 I put a meal together for my wife, a friend of ours who was coming with me to ADF, and myself. I tore leaves of rainbow chard off of the stalks, and roughly tore those leaves into thirds or halves, and cut the stalks into 1/2" thick rings. I started sauteeing chunks of potato, and soon added onion and tempeh. Once the stalks softened, I added the torn chard leaves, as well as some spices (alas, I am writing my entry on Wednesday night, and don't remember all the details). It turned out pretty well, as did the show! I thought that we had very little time for dinner; we came home from groceries and some errands and were thinking of going to see my friend Troy whose band Jaafar was playing. I worked to get a nice meal together quickly, but it was still pointless to go to the concert as I'd likely catch only the last 30-45 minutes of it. I heated a Field Roast handmade stuffed vegan (with apples, squash, and mushrooms) Celebration Roast. Once heated, I sliced it and topped the slices with a gourmet mustard. Ah, the mustard! Some years ago, I loved finding this California Harvest brand of Green Olive and Lemon Mustard with Roasted Garlic, but haven't seen it since. When we were visiting San Francisco a few weeks ago, they had this in a market at San Francisco's Ferry Building! At the Southern Season annual sale that we visited again today, they again had great artichokes bottled in extra virgin olive oil in Italy on clearance for just a dollar or two! We had purchased fresh lemon rosemary bread, and I had the idea to hollow out two end pieces and simply serve the country artichokes in the pieces of bread. It was a hearty and good meal that took little time to put together! We were supposed to go away for the weekend, but our plans changed. My wife got to attend an online bloggers conference tonight, and I went to see the first performers in this year's 75th anniversary American Dance Festival (quite good including an updated piece, the original which we also enjoyed, by Shen Wei where some dancers had paint on their hands or feet, generating an abstract painting in the process!). Before these evening activities, I made dinner. I've not been shopping for a few days, but came up with a good meal from what I had. I noticed that we had a little bit of basmati rice left from last Sunday's dinner. My wife had picked up some flat Indian paratha breads for our travel, as well. I heated both to accompany the main dish. For that main dish, I started sauteeing tempeh, cut into big chunks. 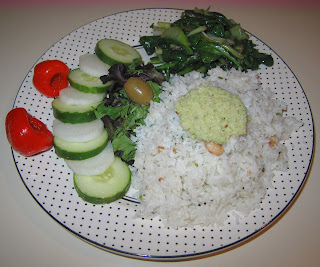 I didn't have canola oil, so used olive - which I don't like to use for the flavor it imparts when I cook Indian dishes. After 3 or 4 minutes, I added half of a thin eggplant that I had sliced into 1/4" pieces, as well as a fifth of a medium red onion, cut into a large dice of maybe 3/8". Eggplant sops up oil, so I had to add a little more oil; a few minutes later, I added a half dozen or so quartered Brussels sprouts and a summer squash, cut into 3/8" slices. A few minute later when everything was cooked, I added a little salt, some chili powder, a pinch or two of turmeric, and a few pinches of my wife's Mom's homemade garam masala spice mixture. I mixed well, then served. 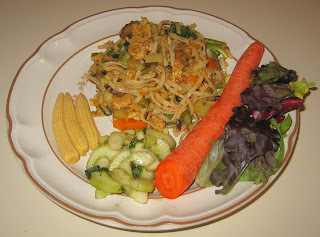 leftover Thai noodles on Wednesday, and decided to use them up. I was surprised to find that the scrambled tangerine tempeh from two weeks ago was still leftover - I had thought that my wife had finished it for a lunch. It was just fine, so I heated it up, as well. I mixed some fresh coconut milk in to the noodles and, shortly before serving, mixed in some Baja Lime marinade, to give it more of a lime kick. I made an interesting salad. I cubed an heirloom tomato, about a third of an orange bell pepper, and finely diced a small shallot. I mixed in a little bit of tangerine olive oil, dill weed, salt, and black pepper. It was good! The six-week photography class that I teach is very popular and always has a wait list of people who want to get in to it. I just finished teaching it last week and again this week with no break I had a new series beginning, also full with a wait list! We usually go out to eat after class, but my wife couldn't make it and ate leftovers at home, plus none of the students opted to join me, so I just came home. I bought taco shells earlier in the week and (though I love making it with my secret ingredient of rosemary) also bought yesterday some tasty guacamole. 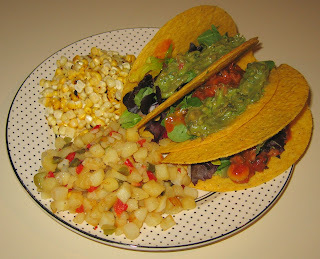 I made a simple but good dinner of tacos, potatoes O'Brien (prepared from a frozen mixture), and corn-off-the-cob. My wife's sitar teacher returned to town just for one night (I'm almost done with posting the pictures from the concert! ), and I had the pleasure of cooking for him. 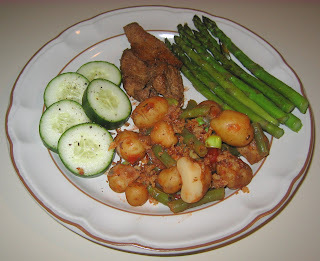 He expressed an interest in spicy Thai food, so I came up with this dinner. I was excited today in the grocery store to see wild leeks. I'd never seen these before; also called ramps, they are apparently a rare Southern US speciality. I hope to get more and try them next week again. I chopped most of a package of tempeh into thin rectangles and started sauteeing them along with a large Yukon Gold potato that I had cut into small 1/4" cubes. 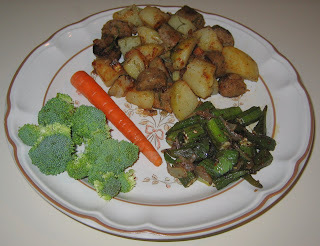 After 7 or 8 minutes as the tempeh was reasonably brown and the potato cooked, I added a number of vegetables: half a dozen wild leeks, sliced, greens and bulbous root both, into maybe 1/2" pieces; asparagus; summer squash; bell pepper; and broccoli pieces. I also put in a few pinches of diced jalapeno pepper and diced ginger. I cooked just for a few minutes more, then added drained broad Thai rice noodles that I had soaked in very hot tap water till soft, and stir fried the noodles for a minute or so. Finally, I then added the rest of the jalapeno pepper and maybe 2 teaspoons of ginger, along with a few tablespoons of finely chopped onion, a little salt, a little vinegar-based hot sauce, and about 2/3 of a can of light coconut milk. I also made a Thai cucumber salad. I mixed a little ume plum vinegar and fresh lime juice with a little bit of diced jalapeno, salt, pepper, and a bit of red chile powder, and let it marinate for an hour or so while I prepared the main course. I served the salad after draining the liquid. We all enjoyed the meal outside on the deck! 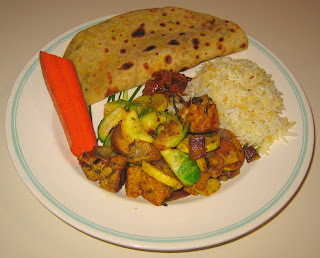 We had leftover rice and roasted eggplant bhagan bhurtha from Sitar Indian Restaurant that we had enjoyed as part of the post-concert dinner on Sunday, as well as some of my Mom's Indian potatoes from the dinner that she had made for my wife, her sitar teacher, and I think one or two of my wife's own students on Saturday. 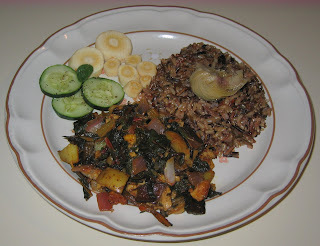 I heated those up and made a tasty side dish by sauteeing tempeh and spinach. Tonight, I went to see the 2007 Italian film, Mio fratello è figlio unico (My Brother is an Only Child); my wife had leftovers on her own so I came home hungry and wanting to make something that I normally don't get to eat. She doesn't like Mexican food, so I made a simple, fast, and tasty meal. 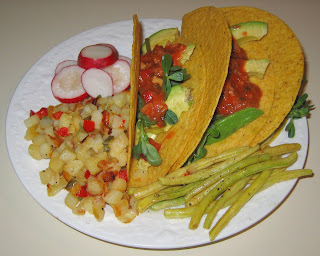 I picked up some taco shells on my way home and made three tacos with artichoke-olive salsa. I heated some pre-made frozen sweet potato fries, and enjoyed a salad. On Saturday, we had a very nice potluck and talk on Judaism and vegetarianism (you can hear the talk on our podcast); my wife missed it as her sitar teacher had just arrived and she wanted to get lessons from him. I picked up some frozen desserts so didn't cook. Yesterday, after the lovely classical Indian concert (which I photographed) including my wife's sitar teacher's fabulous performance, Sitar (happy name for the situation!) Indian Restaurant donated food for the artists, and my wife paid so that we could also eat. We brought the food home (since the restaurant closed early) and have very nice Basmati rice, breads, and a variety of vegetables.